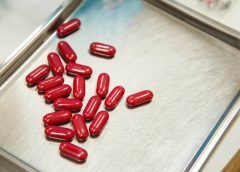 Below is a list of the most interesting moments in the history of science. For more astronomy pictures visit the APOD Index by Nasa. 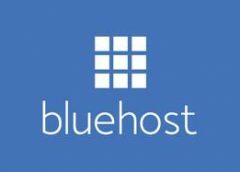 Where you can find images by category.  In addition, at the end of this page are links to all the Astronauts bios directly from Nasa website. 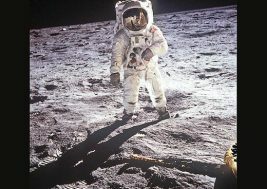 First step on the Moon, 1969 An estimated half billion people experienced it this way: in black-and-white, on television. 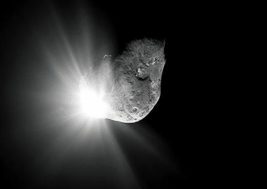 Deep Impact hits a comet, 2005 This simple but spectacular experiment — smashing a projectile into a comet nucleus so scientists could study the material that flew out from the icy core — made a public splash by colliding with Comet Tempel 1 on July 4, 2005. 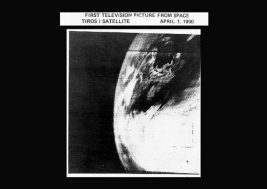 The first weather satellite, TIROS 1, was equipped with television cameras that photographed Earth’s cloud cover — the first in a long line of orbiting atmospheric monitors. 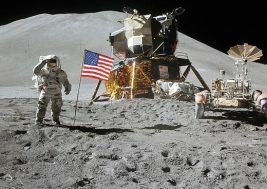 Irwin and flag at Hadley Base, 1971 One of Apollo’s primary goals was boosting America’s image as a technological superpower. James Irwin and David Scott’s Apollo 15 mission was the first to carry a four-wheel rover, which allowed for more extensive exploration. 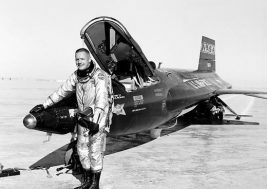 The X-15 made 199 flights to the edge of space between 1959 and 1968. 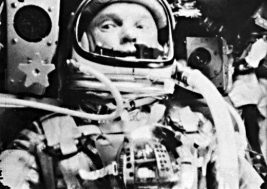 Among its pilots was a young Neil Armstrong. 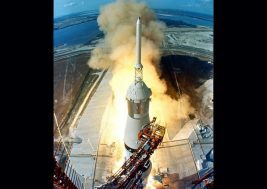 Saturn V Launch, 1969 Liftoff of Apollo 11. Among the best known photos of the giant rocket. 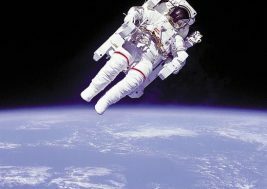 Untethered Spacewalk, 1984 Bruce McCandless II ventured more than 300 feet from space shuttle Challenger in his jet-powered Manned Maneuvering Unit during mission STS 41-B. The first untethered spacewalk in Earth orbit. 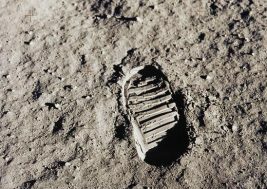 Bootprint on the Moon, 1969 Photographed by Buzz Aldrin, in accordance with Apollo 11 mission objectives, as a way for scientists to investigate the properties of the lunar soil. 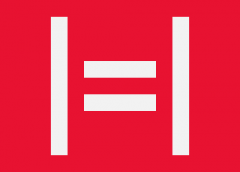 Stands as the classic image representing human presence on the moon. 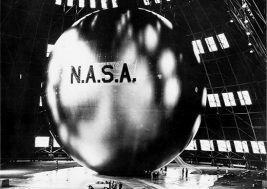 Echo 2 satellite, 1964 Satellite communications pioneers tried several methods of relaying signals from space, including the inflatable ECHO balloons, which successfully reflected telephone, radio, and TV signals back to Earth. 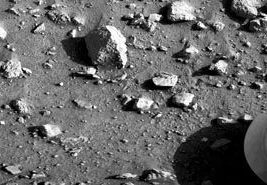 First photo on Mars, 1976 On July 20, 1976, seven years to the day after Neil Armstrong stepped onto the moon, Viking 1 made the first landing on Mars. The robot spacecraft’s first picture was of its own footpad, just minutes after touchdown. 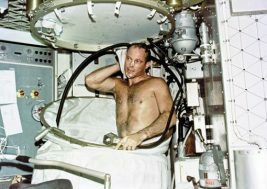 A close up view of astronaut Jack R. Lousma, Skylab 3 pilot taking a hot bath in the crew quarters of the Orbital Workshop (OWS) of the Skylab space station cluster in Earth Orbit. Shuttle ferry flight, 1998 The space shuttle is ferried home to Florida on a Boeing 747 after (now rare) California landings. 1981 Shuttle Columbia lifts off with John Young and Robert Crippen on board, April 12, 1981. 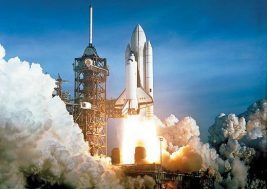 The shuttles have carried more people into orbit than all other space vehicles combined, and are still flying 27 years later. 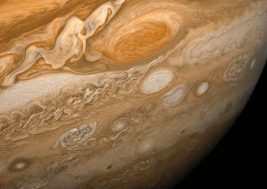 Comet Shoemaker-Levy, 1994 The largest impact event ever recorded. 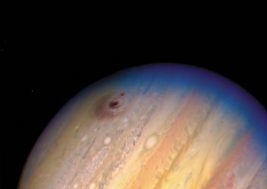 After scientists predicted that Comet Shoemaker-Levy would break up and collide with Jupiter, all eyes — including the Hubble Space Telescope — turned to watch the impacts, which appeared as dark spots in the Hubble images. 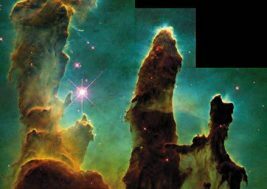 Pillars of Creation,” 1995 Probably the most celebrated image taken by the Hubble Space Telescope. This color-enhanced view of a star-forming region in the Eagle Nebula is a scientific data trove and an aesthetic masterpiece. Hubble Ultra Deep Field, 2004 The deepest (most sensitive) view ever taken of the night sky in visible wavelengths. 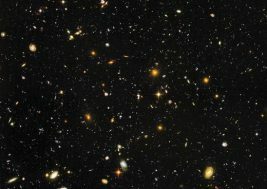 The million-second exposure, taken over the course of 400 orbits by the Hubble Space Telescope, shows more than 10,000 galaxies. First Space Shuttle launch, 1981 Shuttle Columbia lifts off with John Young and Robert Crippen on board, April 12, 1981. 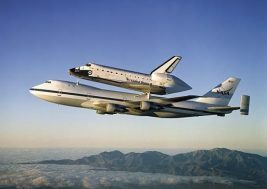 The shuttles have carried more people into orbit than all other space vehicles combined, and are still flying 27 years later. 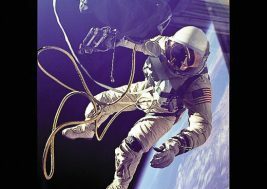 Gemini 4 Spacewalk, 1965 First American spacewalk (Russian Alexei Leonov beat Ed White by three months) and first photographs of a person floating in space taken by another person in space. Apollo-Soyuz, 1975 Alexei Leonov (left) had trained to be the first Soviet man on the moon. 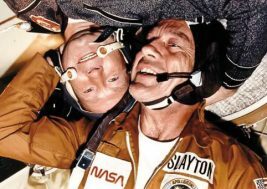 Mercury astronaut Deke Slayton had been sidelined for years due to a heart condition. Their “handshake in space” in July 1975 had more to do with U.S.-Soviet détente than with space exploration. 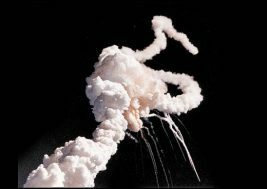 Challenger (STS 51-L) Exhaust Trail, 1986 The destruction of the space shuttle Challenger 73 seconds after liftoff on January 28, 1986. 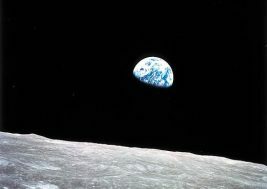 An image that is instantly recognizable to millions who saw the event played over and over again on television. 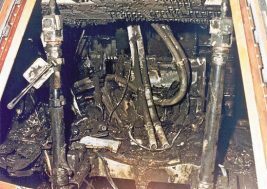 Apollo 1 fire, 1967 The first fatal U.S. space accident, and the first serious setback for NASA’s moon program. 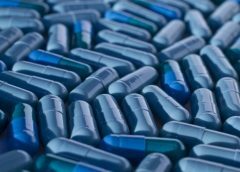 Ed White, Gus Grissom, and Roger Chaffee died during a ground test, when a spark ignited a fire in their sealed, oxygen-rich Apollo command module. Saturn 1 Launch, 1965 The Saturn rocket team included many German émigrés, most of them at the Marshall Space Flight Center in Alabama. 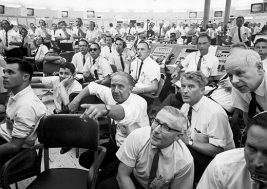 Among those watching a launch at Cape Canaveral on May 25, 1965, are Kurt Debus (pointing, center), Wernher von Braun (to his left), and Eberhard Rees (leaning). 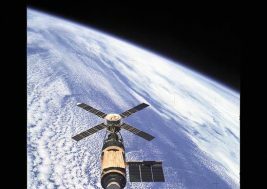 Skylab Orbital Workshop, 1974 NASA’s first space station, Skylab, was almost an immediate failure. 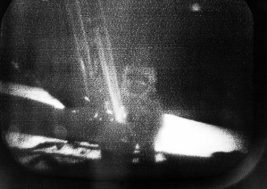 The first crew, led by Pete Conrad, saved the mission by installing a sunshade to replace a meteoroid/sun shield that had torn off during launch. 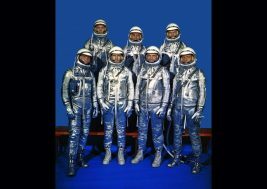 Mercury Astronauts The “Original Seven,” as they came to be known, were all male, and all military test pilots. Only one — Alan Shepard (back row, far left), the first American in space — made it to the moon, on Apollo 14 in 1971. 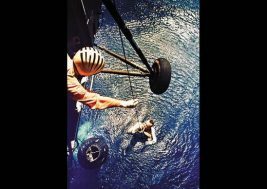 Alan Shepard, Freedom 7, 1961 Launched east from Cape Canaveral, Florida, on a short suborbital hop, Alan Shepard, the first American in space, “splashed down” for an ocean recovery by helicopter — a familiar scene in the 1960s. Sally Ride, STS-7, 1983 The first American woman in space. 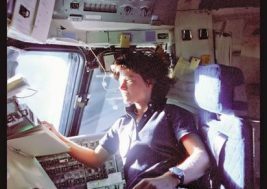 Selected to fly on the space shuttle’s seventh mission, Ride was one of six women selected to become astronauts in 1978, breaking a two-decade-long tradition of an all-male corps. 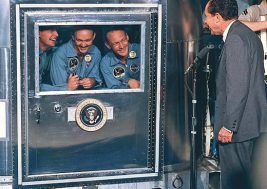 PRESIDENT NIXON VISITS APOLLO 11 CREW, 1969 John F. Kennedy started the Apollo program, but it was Richard Nixon who greeted Neil Armstrong, Michael Collins, and Buzz Aldrin (left to right) in quarantine on board the recovery ship Hornet upon their return from the moon. 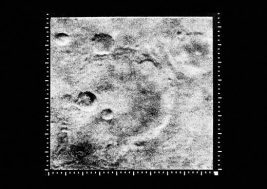 Craters on Mars, 1965 The first close-ups of the Martian surface, taken by the passing Mariner 4 spacecraft, were a disappointment to those hoping to see signs of life. 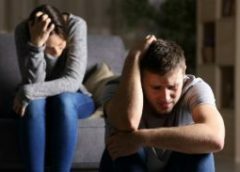 The photos showed a dead, cratered surface. 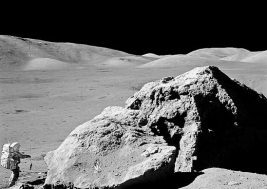 Harrison Schmitt, Apollo 17, 1972 The only scientist to land on the moon, Schmitt had helped train other astronauts to be field geologists. The last Apollo expedition covered the most territory; the astronauts ventured miles from their landing site. 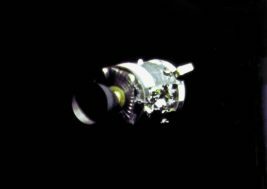 Apollo 13, 1970 photographed their abandoned service module before reentering Earth’s atmosphere that Apollo 13 astronauts Jim Lovell, Jack Swigert, and Fred Haise saw the extensive damage resulting from an onboard explosion that kept them from landing on the moon.